Are you kidding me? My tenants go on vacation for a couple of weeks, and somebody steals all of the window screens off the windows? How I wish it were a joke. Apparently there is value in the aluminum edges. Thirty-two cents a pound to be exact, which means these crooks made off with about $3 worth of recyclable aluminum, that cost me much, much more. Sign of the times, I guess. No need to worry. I've got everything under control. I'm going to show you how I built, installed, and replaced those window screens, right now. You'll learn how to measure and cut the frame, attach the corner clips, roll on the fiberglass screen, and secure it with spline. Let's get started!. Drive to your local Home Depot. 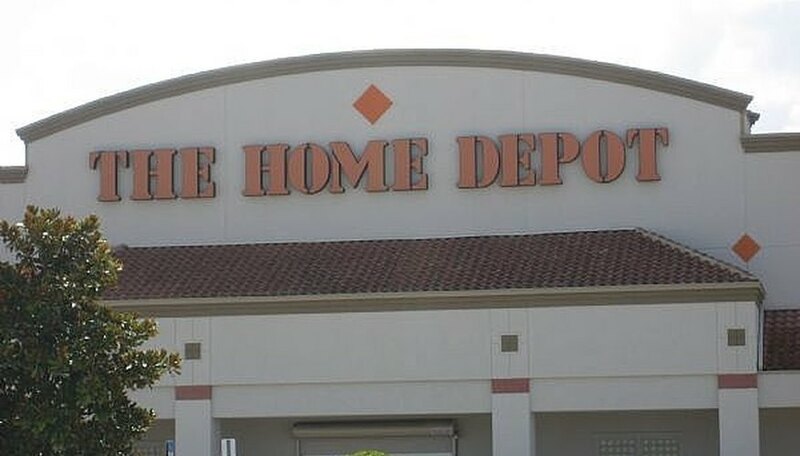 If you don't have a local Home Depot in your area, you may have a Lowe's, or some other building supply store. If not, you can order your materials online. 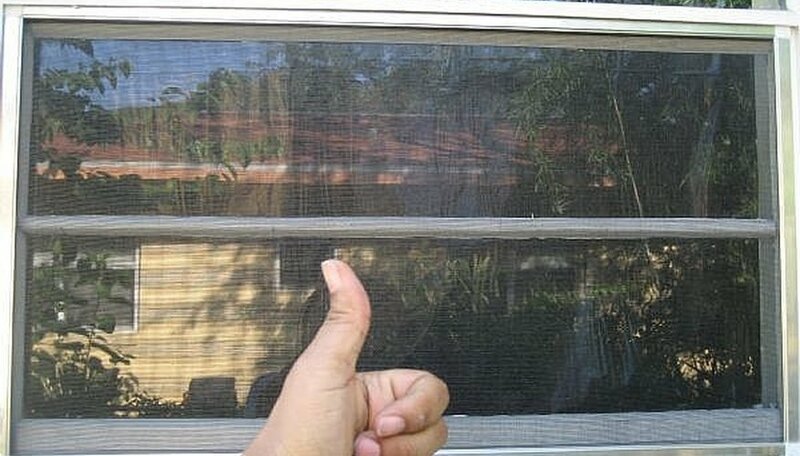 I went to Home Depot, and a nice young man named Jason, helped me understand how easy it would be to build window screens. He was right. 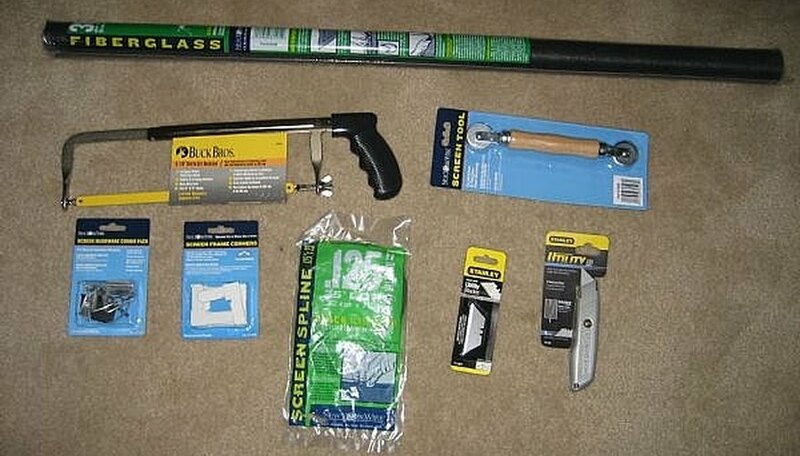 Once you're at the location of the missing window screen, gather your materials, and lay them out. (You should also have aluminum frame pieces, but they are not shown in this picture). 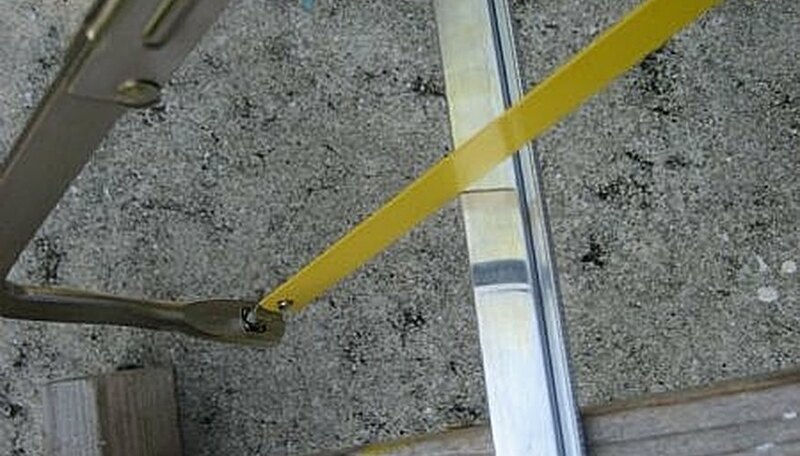 Using your tape measure, (I am using a yardstick, which is much more difficult by the way), measure the bottom of the window, where the screen will rest. You should see a little lip, that keeps the screen from slipping off. 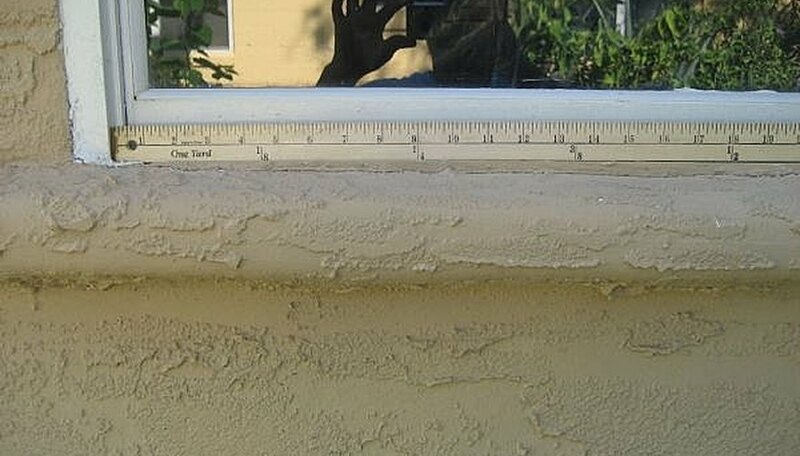 My window bottom measured 34 ½". Go to your materials, and pick up one aluminum frame piece and one frame corner. 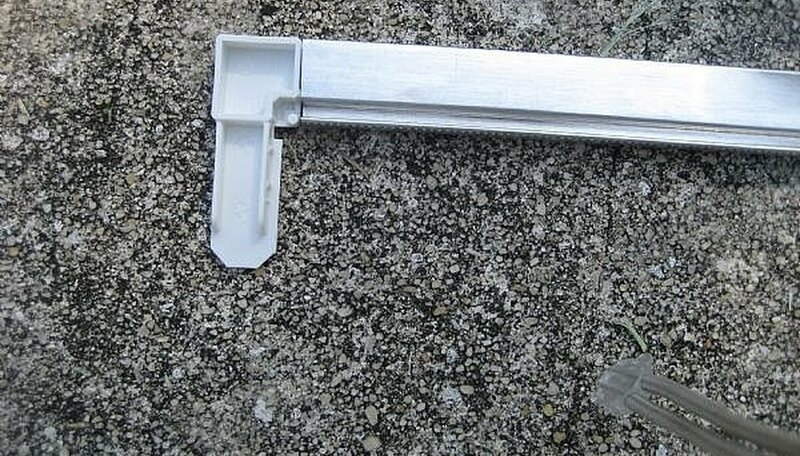 (The aluminum frame piece is shown in this picture). Insert one end of the frame corner, into the end of the frame piece. Push the frame corner into the frame piece until it cannot go in any further. This will become the corner of the window screen. 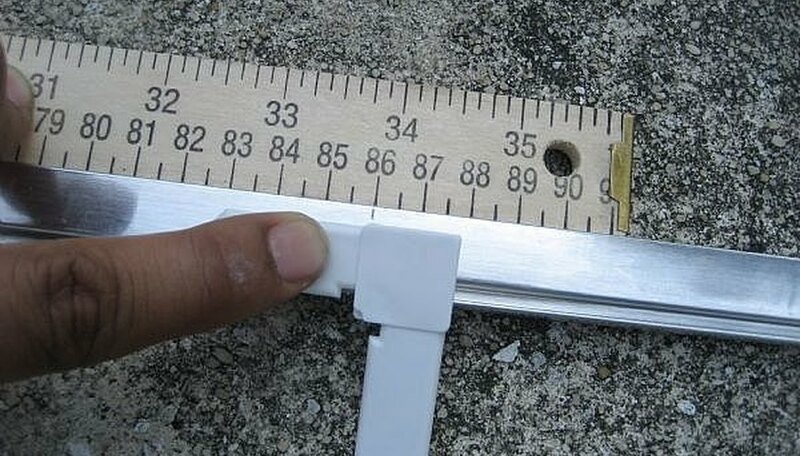 Line up the tip of your tape measure, with the tip of the inserted corner (you can't see it in the picture, because the frame piece is extremely long). 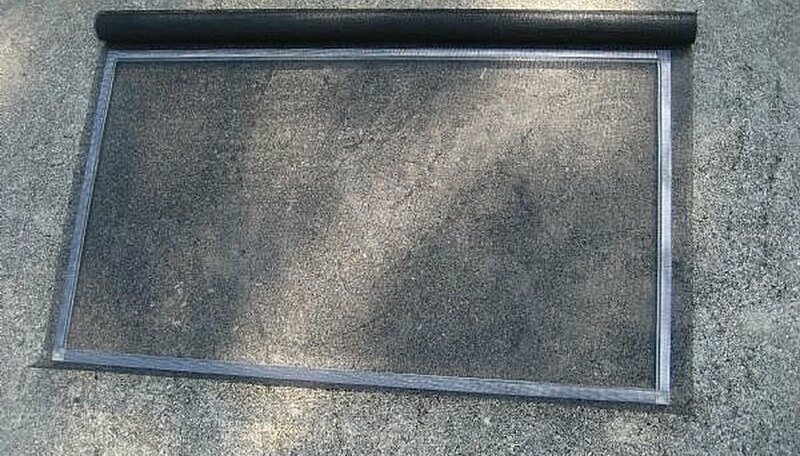 Place the other frame corner on top of the frame piece as if it were inserted, and mark the piece at 34 ½" using the frame corner's edge as a guide. 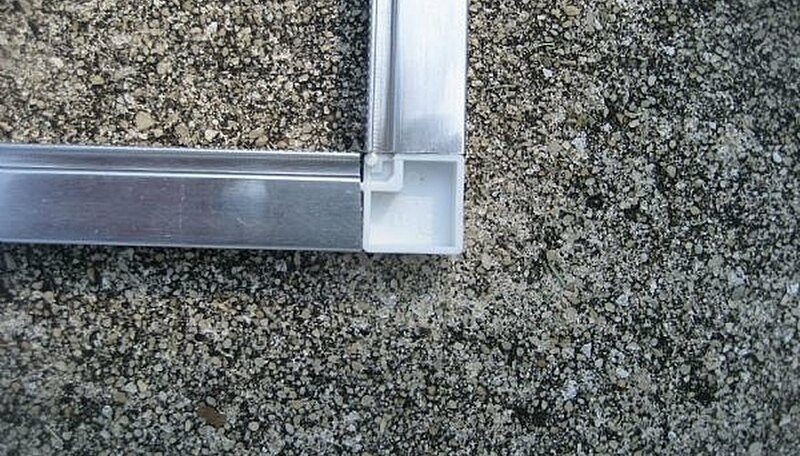 This means that if the clips are 5/8", then you would cut the aluminum frame piece 33 ¼". (34 ½ - 1 ¼" = 33 ¼"). Get your hacksaw. Place the blade end closest to your hand, on the frame piece. With a slow light pull motion, cut a mark into the frame piece. This sets a channel, or groove for the blade, and it will keep your saw from missing the mark. Continue cutting the frame piece to size, for the bottom of the window screen. Next, you want to cut the other frame piece the same as the first. You should now have two 33 ¼" frame pieces, with corner clips inserted into the ends. 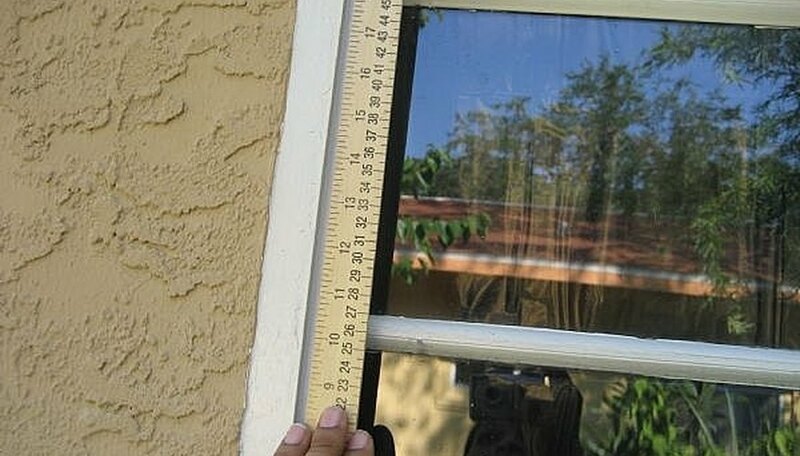 Measure the height distance from the bottom of the window lip to the top of the window lip. The top should have a lip like the bottom, only a little deeper. My height distance was 19 ½", which means I need to cut two frame pieces 18 ¼". (19 ½ - 1 ¼ = 18 ¼"). Cut two metal frames for the sides, and insert the corner clips. 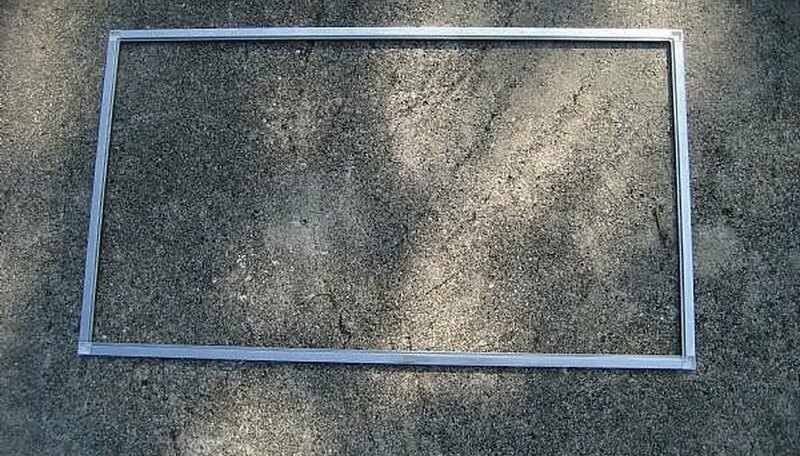 You should have your entire frame, (all four sides), completely connected with the four corner clips. Each of your four corners, should look like the picture. Now it's time to roll on the screen. Make sure the screen you use, extends at least an inch and a half, over all edges as show. Get your spline, it's the rubbery rope type material. Using your Screen Tool, roll the spline into the groove of the frame, making sure to pull the screen tight. Continue this until all four sides of the frame, have been secured with spline. 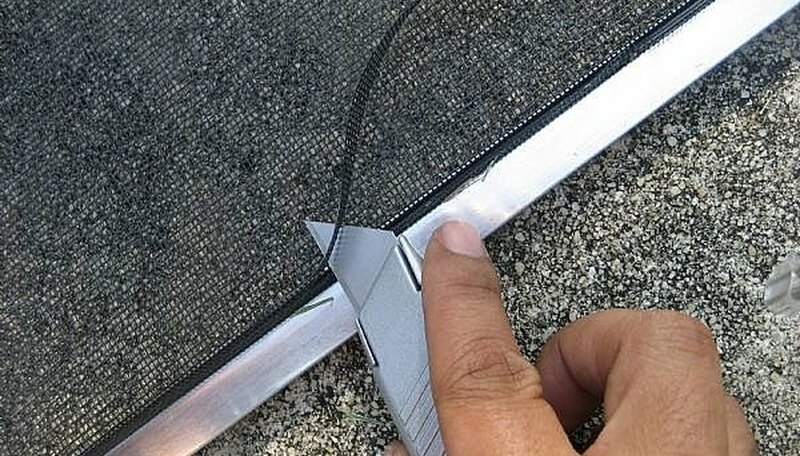 Use your utility knife to cut away the excess fiberglass screen. 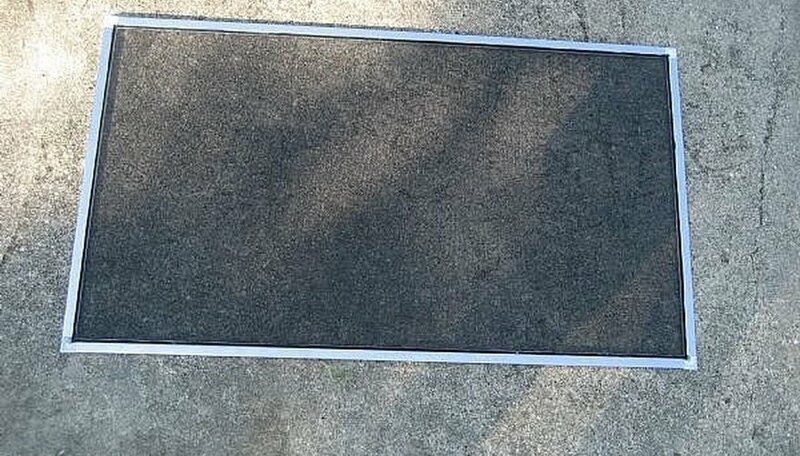 You have now built a window screen! Wasn't that easy? Now, let's install it. At an angle, insert the top of the finished screen into the top lip of the window. Push up as far as it will go, but not so hard as to bend the aluminum. Gently push in the bottom of the screen. Determine if it is worth doing it yourself, or hiring a professional to do the work. 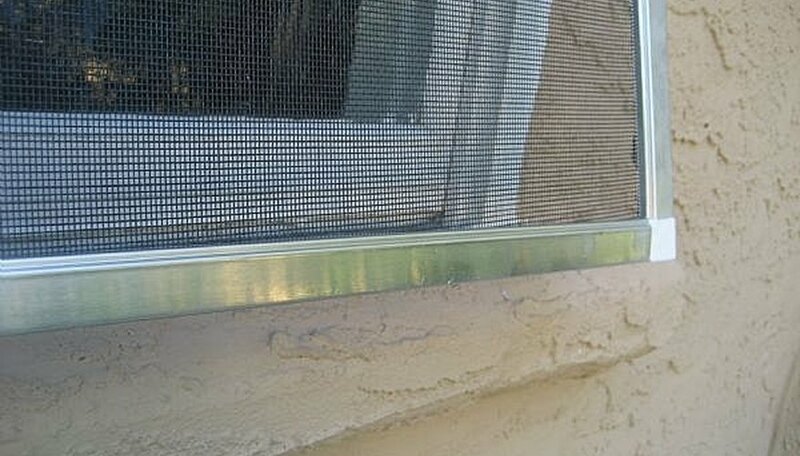 DIY Do It Yourself or Not, has a detailed article which explains the costs associated with replacing window screens. This is helpful information if you're trying to determine whether the savings are worth the effort. Their link is listed in the Resources section below this article. 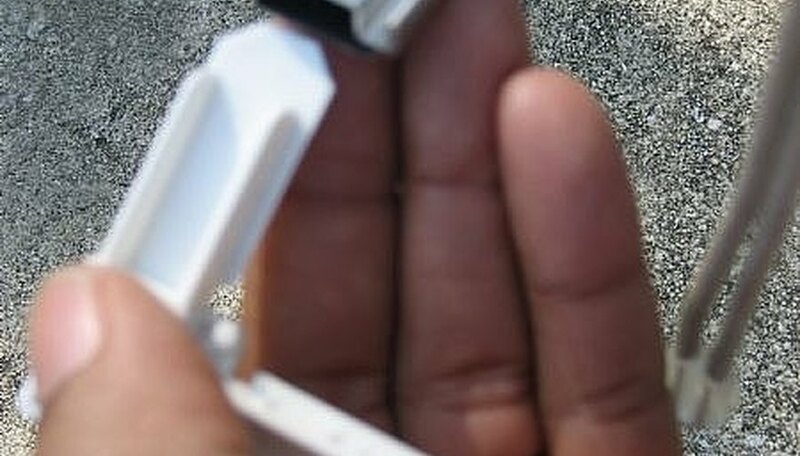 Be careful when inserting the corner clips. Don't force them, doing so may cause you to bend the aluminum frame piece. Be careful not to put your hands too close to the blade. Sometimes the saw may skip, and you don't want to get cut. All photos are author's personal copyrighted images. Do not copy.